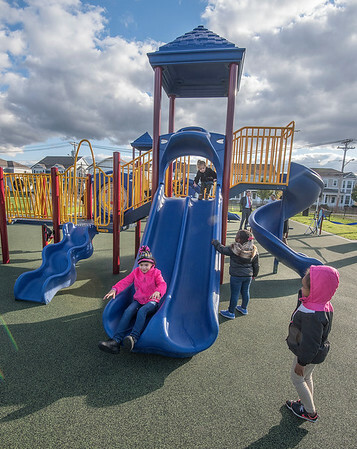 Niagara Falls, NY - Children play at the new D'Amelio Park on Center Aveneu. Mayor Paul Dyster and other dignitaries held a ceremonial ribbon cutting to officially open the park. Niagara Falls, N.Y. - Mayor Paul A. Dyster will join Niagara County Legislator Owen Steed and members of the Niagara Falls City Council for a ceremonial ribbon cutting at the new D’Amelio Park. It marks the city’s 27th park-related improvement project since 2011. City Hall - 745 Main St.